They sing gently outside our windows, these soaring symbols of nature's grace. But sometimes birds' behavior is more consistent with a war movie than a Disney film. A new University of North Carolina study involving cliff swallows examines the birds' reaction times, turning performance and pursuit tendencies during tandem flights - all often taking place during some less-than-social interaction. The study, appearing in the online Journal of Experimental Biology, is the first to track the birds in the field in high resolution. "We like to think that animals are cooperative and all that, but they'll sometimes behave badly, just like people do on occasion," said Tyson Hedrick, a UNC biologist and a co-author of the study done the summers of 2012 and 2013. "Animals turn out to not always be that sweet and cuddly thing underneath." Researchers set up three high-speed cameras at a bridge at Jordan Lake, near Chapel Hill. They revealed that after the swallows returned from wintering in South America, some took shortcuts instead of rebuilding their own mud nests. They stole food and nesting supplies, and laid eggs in neighbors' nests so that baby-sitting was left to others. These instances of birds behaving badly were linked to some creative aerial battles. In one, a bird being pursued by a rival zoomed toward a concrete pylon and then peeled away at the last instant, presumably to avoid a painful crash. Such chases "appear to be due to this individual conflict," Hedrick said. "But it's also a little bit difficult to say exactly what the motivation is, because we don't necessarily see the (original) event take place." He added that the pylon anecdote wasn't repeated enough to establish a pattern of that behavior. "But we did see on occasion that birds are not only trying to avoid their pursuer, they're trying to avoid their pursuer by taking advantage of the environment around them." Pursuers have the added challenge of a phenomenon known as downwash. "One of the dominant patterns that we found strong support for is that a pursuing bird doesn't fly straight behind the swallow it's chasing," Hedrick said. "Because if it does that, it's basically in the downwash (current)." This is simple physics, he said: "The bird is supporting itself against gravity by producing a forward thrust. The only way it can do that is to be accelerating some air in the opposite direction. The bird is creating upward lift and essentially pushing some of the air down behind it. So the wake (turbulent air left behind by the bird, similar to what's left by a ship moving through water) is creating an upward and forward force. "The wake of the bird is traveling downward and backward  which is bad news for anybody flying in that wake, because then they're getting extra drag and extra downward pressure from that wake." Data on turning performance and reaction times are of interest not only to the researchers, but to those in the engineering field. Hedrick said the maximum turning performance during competitive actions and prey capture was a substantial 8 G-forces. Such results have generated interest - and partial funding - from the Office of Naval Research, which may be able to use the findings to build better guidance systems for micro air missiles. He said the Navy is also interested in "How close the birds are willing to go to each other during a chase? ... What's their traffic control like? And how quickly do they react?" The study found that it takes 1.1 wing flaps for a bird to see something and respond to it, Hedrick said. "It looks kind of like these birds can't change a flap in progress. There are some really big muscles powering the wings up and down. Once those muscles have received the command, there's not really any way to interrupt it in progress. Doing something different requires the bird waiting for the next flap to happen. ... So then you might say that maybe if you were to try to design a vehicle with a faster response time, it needs to have smaller wings that flap more often." Brandon Jackson, a postdoctoral research associate at UNC who performed data and recording analysis in the study, said: "For me, the coolest thing is that these birds don't fit into any one little descriptor. They're not always doing the same thing  and within one event, one trial, it looks like they're changing strategy constantly. "We went into it thinking there were going to be some rules  that there would be one strategy, one idea. But that's not the case." 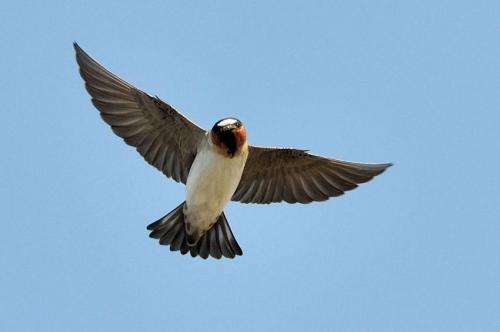 Hedrick said that although other bird species often engage in the same kinds of roguish behavior as the cliff swallows, the latter "are a good model for what a lot of birds might be able to do. They're more convenient to get these data from, because they do these maneuvers out in open space." He added that cliff swallows are a good model for a medium to small, highly maneuverable bird. "Their ability for prey capture success depends on their ability to make a quick, sharp turn." Another key takeaway is "the way these animals behave like a World War I fighter pilot. They're trying to get up above the birds they're interacting with. The chasing bird is always aiming to get itself up above the bird that's ahead of it." But every strategy, real or perceived, has its limits. Hedrick cautioned that "slowing down very quickly, and then when the enemy speeds past you shoot them with missiles"  doesn't work with these birds. "Swallows have an easy time turning, but they're not very good at speeding up once they've slowed down. So if the swallow being chased were to do something that slowed it down in the air, it would be a bit of a sitting duck. The other swallow would just zoom right past, go up, come down fast and then it would be all over." Where, oh where, has the road kill gone?